Since the 1960s, Flora has been manufacturing premium herbal and nutritional products. Their probiotics line has been created by Udo Erasmus, a well-known and respected nutrition expert, worldwide. 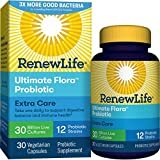 Ultimate Flora offers seven different probiotic formulas designed specifically for different life stages of life while also taking various health conditions into consideration. Humans have trillions of bacteria living within, an on, their bodies. In fact, it is estimated that most adults have 3-4 pounds of these bacterial guests within them at any given time. In the digestive tract, a beneficial balance is struck between the beneficial and harmful microbes. Generally speaking, this results in about 80% good (healthy) bacteria to about 20% bad (unhealthy) bacteria. Typical Western diets, lifestyle, and environmental conditions can all have an adverse effect on the digestive system, disrupting this delicate balance. Other factors which contribute to disruption and dysfunction include illness, stress, ageing, immune system related problems and use of antibiotic medications. For these reasons, it is often important to supplement with a product like Flora Probiotics in order to bring the microflora of the gut back into alignment. Flora offers a range of probiotic products, each of which is specifically designed to work with different age groups and those individuals with specific health needs. These products are in the specialty Udo’s Choice line, indicating they are made with only premium highly sourced ingredients. The probiotics used in Udo’s Choice products are engineered specifically for Infants, Children, Adults and Advanced Adults (Seniors). Other available selections include Super Potency, Hi-Potency Bowel and Super Lozenges. Each specialty products contains essential bacteria which are known to benefit the intended consumer. Over 400 kinds of beneficial bacteria call the human gastrointestinal tract “home”. Together, they protect the GI tract from pathogenic microbes which are encountered naturally through foods and the environment every day. Pathogenic bacteria, yeast and fungi cause disease and illness if not properly countered with friendly bacteria and yeast. These good harbingers of health colonize our intestines and stomach to create an environment wherein the unfriendly guests cannot survive. Probiotic organisms are necessary to convert carbohydrates from our foods using a unique fermentation process. This turns the sugars in our foods into acids (like lactic acid), hydrogen peroxide and other useful chemical compounds. By creating an acidic environment in the early digestive tract, most unhealthy bacteria are unable to survive. As food continues from the stomach into the small and large intestine, other probiotic bacteria and enzymes work ceaselessly to break the food down to enable nutrient absorption through the intestinal lumen. There, they are taken up for use by the rest of the body. When the fragile balance of this ecosystem is disrupted, due to any cause, supplementation with viable cultures of helpful microbes like those in Flora’s line of probiotics can help the system regain a healthy and safe balance. The probiotic microorganisms found in Flora products are able to out-compete unfriendly bacteria. After a disruption, when the balance of the microflora is restored, many people report relief from diarrhea, constipation, abdominal discomfort, gas and acid reflux. Infants who experiencing symptoms related to colic often benefit from supplementation with probiotic drops or liquid supplements. Children’s chewable tablets are also available in fruit flavors which are designed to support proper digestion and good immune function. Individuals who have taken a course of antibiotics often use probiotic supplements to bring the balance of healthy bacteria and yeast back to their digestive system as quickly as possible. Dr. Udo provides clear dosage recommendations for each product in his probiotic product line. Flora probiotic offerings should be taken after a meal when the stomach acids are lowest. Dr. Udo believes 99.9% of probiotics taken prior to a meal are destroyed by stomach acids, rarely enabling them to reach the small intestine or colon. The CFU (colony forming units) listed on Flora probiotics are an accurate accounting of the viable colonies at the time of manufacture, not at the time of consumption. Dr. Udo explains that supplements which are kept refrigerated will lose about 2-4% potency each month, while those which are not refrigerated can lose from 20%-40%. Therefore, he recommends keeping Flora probiotic products refrigerated for best results. Most people can take probiotic supplements without experiencing any side effects. Those who do experience side effects usually report mild symptoms such as bloating, abdominal discomfort or flatulence. These symptoms usually subside with continued use or by lowering the dose for the first 1-2 weeks while giving the digestive system time to adjust. Individuals with artificial heart valves and people whose immune system is known to be compromised should not take probiotic supplements. Dr. Udo’s Flora probiotic line is especially designed to work with individuals at each stage of life while taking into consideration many health issues some individuals may face. Flora probiotics can be purchased online at better nutritional supplement shops and can sometimes be found in health food stores.